Here are some of the best free apps, app updates and new apps that have landed in the App Store recently. 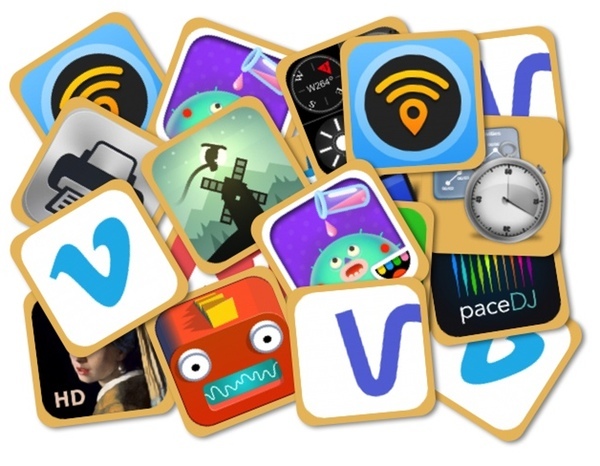 Today's notable apps include PaceDJ, Toca Lab and a handy Vimeo update. All app prices are USD and subject to change. Some deals may expire quickly, so grab them while you can. Microbots [iOS Universal; Now free, down from $0.99] Danger, a Microbot infestation is imminent! Test your skill, strategy and speed in this great arcade puzzle game that will keep you addicted for hours. PaceDJ: Music To Drive Your Running Pace [iPad; Now free, down from $2.99] Run longer, faster, and stronger with PaceDJ, the only app that modifies music BPMs to match your running pace AND allows you to create interval workouts. Portrait painting HD [iOS Universal; Now free, down from $1.99] Portrait painting HD has 1187 paintings, created by the greatest masters of all times from Renaissance to Contemporary history. Survival GPS(Flashlight ,Compass, Speedometer, Altimeter, Course and Map) [iPhone; Now free, down from $0.99] Suruvival GPS is designed specifically for travelers. Fast and easy With the most elegant design and the fastest startup. Super Video Converter [OS X; Now free, down from $25.99] Super Video Converter has the ability to convert any video format to popular video like MP4, MKV, DivX, RMVB, MOV, M4V, AVI, FLV, WebM, and WMV, etc. Printer Pro - print documents, photos, web pages and email attachments [iOS Universal; Now free, down from $6.99] Print attachments, documents, web pages and more right from your iPhone and iPad to any Wi-Fi or USB printer. Apple's App of the Week! Toca Lab [iOS Universal; On sale for $0.99, down from $2.99] Welcome to Toca Lab! Explore the colorful and electrifying world of science and meet all 118 of the elements from the periodic table. WiFi Map Pro - Passwords for free Wi-Fi. Good alternative for roaming [iOS Universal; On sale for $0.99, down from $4.99] Get WiFi passwords for FREE internet access all over the world! Useful for TRAVEL! Works offline. WritePad for iPad [iOS Universal; On sale for $4.99, down from $7.99] WritePad is an advanced notetaker app that lets you to take notes in your own handwriting, which is immediately converted to the digital text using PhatWare’s state-of-the-art handwriting recognition software. Timing [OS X; On sale for $4.99, down from $14.99] Timing is the best way to keep track of the time you spend with your Mac. Find out where your time goes - without ever having to start a timer again! Vurb - Find, Plan, and Do [iPhone; Free] Vurb lets you find, plan and do— all in one place. Connecting you to relevant information and tools from apps, you no longer have to switch between different apps to get things done. Posterist [OS X; Free] Creating excellent collage has never been this easy! With Posterist you can make gorgeous collages, posters and cards from your favorite photos in a matter of minutes. Chromecast has arrived. You've been desperate to magically stream, er, cast Vimeo vids on your big screen — and now you can! Thanks for your patience! We also fixed some bugs you so dutifully reported: No more pesky words when flipping the player from portrait to landscape mode; video file sizes now display 100% accurately; password-protected Watch Later videos now show up in Downloads. We're just getting geared up. More app-dates are on the way!